Anyone can relate to those feelings we get when we leave home for the first time, whether to start university, train for a course or – in the case of Saoirse Ronan’s Eilis in Brooklyn – moving countries to start a new life. “Homesick is an illness,” Jim Broadbent’s humble priest tells our heroine, “one that is eventually passed onto someone else” – he has a point, because once those longings for home eventually evaporate you start to feel more at home in your new environment and grow a certain level of independence. Brooklyn, with John Crowley directing from a script by Nick Hornby (who in turn adapts Colm Tóibín’s novel of the same name), captures these universal feelings with enviable ease and engulfs a stunningly told tale of a young woman achieving her independence and finding her true calling. Her story begins as she sets sail from 1950s Ireland to the suburbs of Brooklyn, New York, where she finds lodgings in a house operated by the strict Madge Kehoe (Julie Walters) and, thanks to Broadbent’s priest, a job working in a department store. However, her longings for her old life back in Ireland start to overwhelm her and she becomes gravely homesick; but things change when she starts taking night-time classes on bookkeeping and, most crucially, when she meets and falls for young Italian plumber (no, not THAT one…) Tony, played by Emory Cohen. However, before things can get all West Side Story with their little relationship, Eilis is suddenly called back to her native home in the wake of a tragic event, which is where the internal drama starts to truly take form. As she wows her former neighbours about her overseas exploits, she grabs the attention of lowly young pub owner Jim Farrell (Domhnall Gleeson) whom everyone considers more than a perfect match for Eilis, but she herself has a bigger dilemma on her mind; namely, where her true calling is and where she should consider her true home. The answer, to some, may be fairly obvious, and to others perhaps not quite so much, and although the story itself is a little light it doesn’t take away from the undeniably soothing tone that equals its giant heart in size. We are there with Eilis every step of the way, from sailing across the rough seas in a ferry (including a scene of sickness that calls back to, of all things, Bridesmaids) to entering the country for the first time onwards, and her struggles with learning to be independent as well as containing her feelings of homesickness gain both our sympathy and our full respect, leading us to want to see her achieve her dreams and not succumb to moments of weakness. A major part of our connection to the character, aside from the character being written wonderfully, really is who they brought on board to play her. Saoirse Ronan is a true marvel here, conveying both her character’s fears and levels of excitement – sometimes both at the same time – through the simplest of expressions, and even in her calmest moments she is a force of nature as she sells every scene she’s in (keep in mind, she’s in 95% of the film) and keeps us fully engaged with whatever her character is doing. Other actors in smaller parts, from character actors like Jim Broadbent and Julie Walters to younger players like Emory Cohen and Domhnall Gleeson, are all good too, but when it comes to competing against the main attraction nothing can overshadow her. Ronan perfectly fits in, too, to the period setting that Crowley has crafted through a crew of talented production and costume designers, all of whom lovingly recreate the fashions and interiors that 50s New York had to offer. The costume work, in particular, gets a lot of rightful attention, since some of the dresses that Eilis wears throughout her time in New York are truly wonderful designs; her black maid-type work clothes offer a subtle hint of funeral procession, as anyone who’s ever worked in retail will probably pick up on, and many of the others stand out thanks to dominant colours of yellow, blue, green and countless more. There’s no denying that Brooklyn is a wonderful film all around, but the one thing we would say against it is that the storytelling, while refreshingly direct and singular, is very light, at least in terms of its dramatic stakes. No spoilers here, but the main conflict that arises towards the film’s third Ireland-set act lacks the kind of drama that everything prior seemed to be leaning towards. There’s definitely drama, don’t mistake us, but when you see it you will instantly recognise how light it can be, especially when things are resolved – or not resolved – with such ease. This, however, is only a mere complain out of someone trying to find a fair balance in something that is already fair. 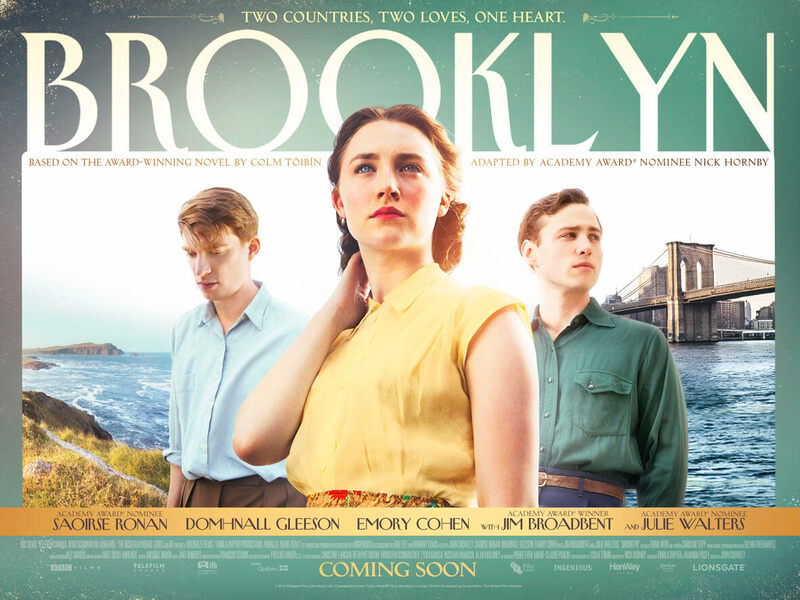 Brooklyn is still a lovely little film that has its true qualities leave all its misgivings in the dust, and is a film that is destined to find its audience whether it’s fans of Ronan’s previous work (who will be very satisfied by her fantastic performance here) or anyone who has also had those longings for home. Don’t worry, this film understands exactly how you feel. Brooklyn is a wonderful film about gaining independence and making a home for yourself, and it’s told through such heart and emotion thanks to some stunning production work and, most notably, Saoirse Ronan’s extraordinary performance as the woman at its warm centre.